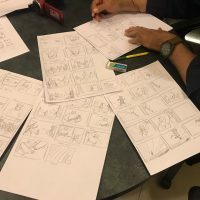 We are very excited to be working with an award-winning animation studio in Mumbai called iRealities to produce this movie title – Motherhood: The Journey of Mata Sahib Kaur. iRealities brought the acclaimed and successful Chaar Sahibzaade film to our screens in 2014, breaking 22 records in the Punjabi film industry, and topping the business chart in UK, Australia and New Zealand. We are proud to be working with a studio that understands religious sentiments and can provide high quality animations.